There are ways to get rid of the water and it’s important to do so. Standing water can lead to poor soil on top of the water. This can cause the roots of nearby plants to rot and drown. If the standing water is within ten feet of the foundation of your home, the water can eventually work its way into the home. Mosquitoes also breed in standing water. 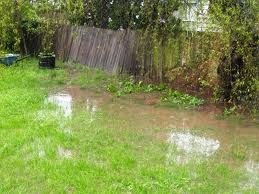 Spreading soil will not be enough to get rid of the standing water. Some sort of drainage system will need to be established. Dig a trench from the area with the standing water to the lowest part of the yard, preferably a drainage ditch. Make the start of the trench area six inches deep and five inches wide. You’ll need a four-inch perforated, flexible drainage pipe. Cut the drain pipe so that it’s the same length as the trench. Cut a sheet of mesh screen into two circles that are six inches in diameter. Take those mesh circles and place them over the pipe. Secure with duct tape to keep debris from entering the pipe. Lay the pipe in the bottom of the trench with the perforations facing upward. Cover the pipe with one inch of gravel to keep the soil out of those perforations. Fill in the rest of the trench with the soil. Keep an eye on the roof and gutters of your home. The water all needs to go somewhere. Make sure the water that comes out of those areas does not create another situation where you are dealing with standing water.